This is true, you are now eating for two but what people get confused with, is that you are not eating for two adults! You do not need to eat double your normal amount. Don’t forget, the baby starts off smaller than the size of a pea and only grows to around 6-10lbs before they are born so really don’t need much at all. 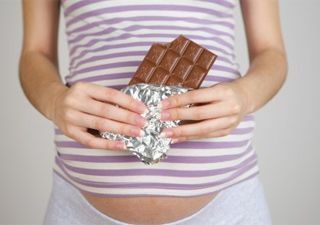 During the first and second trimester pregnant women are advised to eat no more than that of a non-pregnant woman. In the third trimester an extra 200 calories per day is all you need to support your growing baby. This is the equivalent of a small bowl of cereal, a banana or a pot of yogurt. The extra weight gain is not only a bore when you are trying to get back into your jeans, but it can cause all sorts of complications throughout your pregnancy and birth. You will naturally gain weight throughout pregnancy due to your growing baby and your body accommodating him or her. The amount of weight you should gain depends on the weight you were before you became pregnant but an average weight gain is between 10kg – 12.5kg with the most weight being gained from 20 weeks onwards. You do need to remember that whatever you eat goes to the baby too, so this is where you DO need to be “eating for two” and trying to keep your diet as healthy as possible for both of you. Keep your diet as fresh as you can with lots of fruit, vegetables and water to keep you hydrated at all times. Enjoy your pregnancy, but just not too much!! Keep those treats as treats and fuel your body with things that will benefit you and the baby.